22 members of Saratoga CERT attended the first general meeting of 2019, plus Michael Taylor and Crystal Bothelio from the City of Saratoga. This is the largest group at a general meeting for many years, possibly for all time, and the level of enthusiasm was high! Crystal will be taking over for Michael Taylor, when he retires this summer, as the primary contact between the City of Saratoga and the Saratoga CERT volunteer program. The plan is that there will be a general meeting every two months. In addition, there will be meetings at the division level as relevant, plus many opportunities for training—see below for more on this. Michael Taylor informed the meeting that there are now 13 Automated External Defibrillators (AEDs) positioned around the City and that all Santa Clara County Police vehicles are now also equipped. He asked the meeting for approval to buy an AED for the CERT trailer for a cost of $1600. The meeting agreed: Ayes 20, nays 2. Michael will provide a list of locations for all the City’s EODs so that this information can be kept as part of the Emergency Operation Manuals (EOD) for both the City and divisions. Michael informed the meeting that he is close to completing a fully developed EOD for the City. He is currently working on sections to cover wild fires and CERT. Charles Rader is also close to completing a CERT division level EOD for Cox Division, which can then serve as a model for other divisions. Charles observed that the EOD currently does not have a section to cover the care of animals—which he has undertaken to create. The meeting discussed the need for a secure online location either, within the current Saratoga CERT website or at a third party, where the EOD, contact lists, etc. can be kept—enabling both easy access to the information for CERT members, and the ability to keep documentation up to date and in sync across the City divisions. The City has enough FRS/GMRS radios to provide one to all active CERT members with DSW cards. Craig Pietrow is responsible for distributing these and can also provide and stock backpacks for those who don’t have one yet. Upcoming distribution dates will be in the monthly newsletter. Radios can also be made available at division meetings. Saratoga CERT now has active divisions for Cox, Quito, Vineyard and Argonaut, but there are still a number of active CERT members in areas that are not within a division. The meeting discussed the need to get all members of CERT connected to a division even if, for now, it was not in their immediate area. Brent Hailpern is currently responsible for both leading Saratoga CERT and for managing all aspects of IT. He needs somebody to take one of these responsibilities from him as soon as possible. There is also a need for deputies in many positions and division captains in areas with no current active division. Michael Taylor informed the meeting that the City buildings have recently been recognized by the Red Cross as priority shelters. West Valley College and Redwood Middle School are already recognized. The City/Red Cross needs people (who don’t have to be CERT) to be trained as volunteers. This 3-hour class is scheduled for Thursday Feb 28, 6pm. A Ham radio infrastructure is developing across Saratoga, and the hope is to be able to start offering Ham training in Saratoga soon. The intent is that all Saratoga CERT will have an FRS radio and that there will be sufficient CERT members in Saratoga with a ham license, so that, in the event of SCCAlert failing in an emergency, we can be activated by radio. Ham Crams continue to be available in Los Gatos. The next one is Saturday Feb 9. 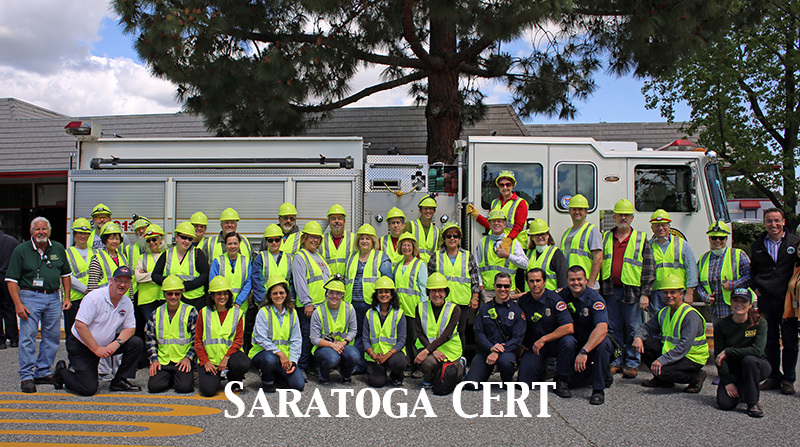 Campbell CERT have invited Saratoga CERT to join their training classes, which is a fantastic opportunity for us in Saratoga – as Campbell is a very well-established division with excellent leadership and training. All who attended Campbell CERT’s Stop the Bleed class said it was excellent. Unfortunately, classes are now fully booked, but the intent is to make the class available in Saratoga later this year. All CERT are encouraged to attend, date(s) to follow. Campbell will be running a “Miserable Exercise” in February – the intent being to practice our CERT skills, not on a nice warm Saturday morning but on a rainy day in the dark! Those who have taken part in this in the past, speak highly of it. The exercise will take place on either Feb 4 or 5, with three days’ notice (the date will depend on the weather forecast and the number of interested participants available on each day). All are encouraged to take part. See 1/26 post for details. Jessica Fullmer asked for volunteers to help staff outreach events at The Blossom Festival (April 3) and the Classic Car Show (July 28). CERT members are encouraged to meet with their local neighborhood watch groups (e.g. attend one or more meetings) so as to talk about CERT and encourage participation. Optimally, each neighborhood watch group would have at least one active CERT. The country drill at Moffat Field in Fall 2018 was a great success. There will be no country drill in 2019 but one is tentatively scheduled for Spring 2020. There will be a number of County Ham drills during 2019 and the meeting discussed CERT members getting involved. The next one is Feb 23, 10am-12pm.